Controversies over land acquisition and lack of financial resources have put brakes on the ambitious plans of the Himachal Pradesh Housing and Urban Development Authority (HIMUDA) to provide plots, houses and flats to 72,848 applicants. Speculations regarding Chief Minister PK Dhumal’s choice of seat to contest the next Assembly elections are keeping aspirants from both the Congress and the BJP on tenterhooks. The simple technology developed by CSK Himachal Pradesh Agriculture University, Palampur, has found few takers among farmers of the state. The mechanisation of horticulture is on the cards under the National Horticulture Technology Mission (NHTM) as the Fruit Research Station (FRS), Bajaura, of the Dr YS Parmar University of Horticulture and Forestry and the National Horticulture Board (NHB) have come out with a project to prepare hill farmers to face the global competition in domestic markets. Though the nation observes the Kargil war as Vijay Divas, Dr NK Kalia, father of martyr Capt Saurabh Kalia, has been moving from pillar to post to book and punish those who had indulged in the most heinous and inhuman ways of torturing his son for three weeks before shooting him dead. 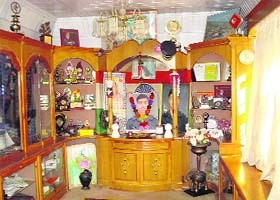 A view of the Saurabh Kalia Memorial at his residence in Palampur. Twentytwo old buildings of government primary schools in the district have been ordered to be demolished by the district administration after due consideration of their condition. All privately run schools must obey scrupulously all provisions and conditions of the recently enforced Right to Education (RTE) Act, 2009, and observe all rules enforced by the HP Government under the Free Education to Children Rules, 2011, with immediate effect. 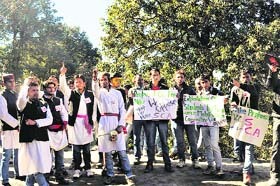 The Students Central Association of Himachal Pradesh University has threatened to launch a stir if the authorities go ahead with the proposal to increase the fees. President of the association Puneet Dhanta said at a press conference here today that if the executive council of the university approved the proposal at its meeting, scheduled for January 31, the association would mobilise the students against the decision and start an agitation. Calling for immediate measures to tide over the acute financial crisis plaguing Himachal Pradesh University, member of its executive council Waryam Singh Bains has asserted that a fee hike alone will not help. He has demanded the implementation of the recommendations of the resource mobilisation committee in toto. The HP High Court has set aside the decision of the Himachal Pradesh Housing and Urban Development Authority (HIMUDA) asking the allottees to meet the additional cost of plot in respect of plots and houses allotted in 1990 under the fifth partially self-financing scheme. A cultivable mycorrhiza-like fungus discovered by scientists of Amity University may prove to be a boon for vegetable growers of Himachal Pradesh as it has tremendously increased the crop growth and productivity. Various farmer organisations under the banner of the Himachal Kishan Sangh, the Kishan Kalyan Samiti and the Krishak Vikas Samiti met Chief Minister Prem Kumar Dhumal during his recent visit here and appealed to him to cancel the Memorandum of Understanding (MoU) signed by the HP Government to set up a cement plant near here. They requested him to set up some environment-friendly industry in this area. The BJP has urged the state Congress to take a cue from its Gujarat unit and appreciate the achievements and good work carried out by the Dhumal government. Having a dig at the Congress, spokesperson for the party Ganesh Dutt said if the Gujarat Congress could openly praise Narinder Modi, the party should not have any reservations in doing the same in Himachal. The police on Monday night nabbed a burglar loading cribs and other material in his van behind the new bus stand. However, his accomplice managed to flee. SDPO, Kangra, Dinesh Kumar said on a tip-off, the police raided a site behind the new bus stand and nabbed Subhash of Nathered village. A 48-year-old man from Mandal village died at the DRPGMC Tanda late last night following the consumption of poison at his residence by mistake, the police said here today. With hardly any land available at places for which the maximum applications have been received and controversies over the cost and location of whatever land the public sector undertaking has acquired, most of the applicants will be disappointed. It has so far failed to come up with any concrete plans for the development of plots and flats for any of the 59 townships for which applications were invited. HIMUDA had collected Rs 36.5 crore from the applicants, each of whom paid Rs 5,000 each, as part of the demand survey under two schemes and promised to pay an interest of 5 per cent after one year. The first scheme under which 45,357 applications were received has already completed the stipulated period of one year and the interest will be payable to the applicants on the second scheme from April 1 onwards. With no plans in the offing, the applicants are in no position to decide whether to withdraw the amount or allow HIMUDA to retain the money at 5 per cent when banks are offering 9.5 per cent interest. Even at 5 per cent, it will have to pay Rs 1.80 crore as interest annually. Its failure to come out with concrete schemes within the stipulated period will make a case for payment of interest at higher rates, more so because it has invested part of the money in fixed deposits. Further, the maximum number of 62,484 applications were received for plots, followed by 7,020 for flats and 3,344 for independent houses. Accordingly, 25,000 to 30,000 bighas of land will be required and HIMUDA has only been able to acquire less than 500 bighas, that too riddled with controversies. Some chunks of land, particularly in Sirmaur district, are not considered suitable for housing. In Dharampur, where land was selected after carrying out a proper feasibility survey as per which the profit from the project worked out to Rs 15 crore, HIMUDA is being accused of acquiring land at higher rates. Chief Executive Officer (CEO) of HIMUDA BB Kalra said the prescribed procedure was followed and a three-member negotiation committee headed by the Deputy Commissioner and having the CEO and tehsildar of HIMUDA as members approved the rate. The negotiation route instead of acquisition helped in avoiding litigation as landowners invariably challenged the land compensation award. He would propose inclusion of the tehsildar (revenue) concerned, who was fully conversant with the kind of value of land, in the committee to further improve the process. The Chief Minister, who represents the Bamsan constituency in the state Assembly, will have to opt for a new Assembly constituency as this constituency has ceased to exist after the last delimitation exercise in the state. The areas falling under the erstwhile Bamsan Assembly constituency have been merged into three segments. These are the Hamirpur, Bhoranj and the newly created Sujanpur Assembly segments. Since the electorate of the Bamsan Assembly constituency had elected Dhumal by over 25,000 votes in the last Assembly elections, he will definitely want a similar kind of support in the new Assembly constituency. With the Bhoranj Assembly segment reserved for an SC candidate, the natural choice of Dhumal is likely to be either the Hamirpur or the Sujanpur constituency. The Chief Minister has not made any categorical statement so far about his choice of Assembly constituency, which has kept aspirants from both the BJP and the Congress guessing. Sitting BJP MLA from Hamirpur Urmil Thakur had been hopping between the Sujanpur and Hamirpur segments for the past quite some time for this very reason. Some time ago she had also concentrated her activities in the Sujanpur area, but with no clear signal coming from Dhumal, she is keeping an eye on both the Sujanpur and Hamirpur Assembly constituencies now. Former Hamirpur Congress MLA Anita Verma had also shown her keenness to shift to the newly carved Sujanpur Assembly constituency, but her calculations also depend on Dhumal’s choice since in all probability she will not like to contest against the sitting Chief Minister. Another aspirant Rajinder Rana has been focusing his activities in the Sujanpur Assembly segment. Rajinder Rana is in a difficult position since he will not like to contest against Dhumal, who is his mentor, and does not have the option to shift to Hamirpur in case Dhumal decides to opt for Sujanpur. All of them are speculating that Dhumal will opt for the Hamirpur constituency. However, since Dhumal has kept the cards about his choice of constituency close to his chest, all the aspirants are on tenterhooks. The simple technology developed by CSK Himachal Pradesh Agriculture University, Palampur, has found few takers among farmers of the state. 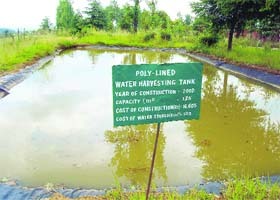 A model for conserving rain water, developed by the Palampur agriculture university, can offer a solution to at least the drinking water problems of the district. University experts while talking to The Tribune said, “In our campus we selected low-lying areas where rain water from the adjoining area generally used to gather. We then widened the areas and found that the water gathered there after rain. However, initially a problem was faced as most of the water was lost to underground seepage in a short time. Then we used plastic sheets at the bases of the ponds. The plastic sheets did not allow water loss. The water gathered in the ponds can be used for irrigation purposes for several months. If farmers develop similar models in their respective areas, they can overcome the shortage of irrigation water at least during winters. This year farmers of lower hills lost about 80 per cent crop in Una district due prolonged drought in November and December. According sources in the agriculture department, the loss amounted to Rs 42 crore in Una district alone. Though the university has successfully developed the models, these have till date remained limited to the campus only. The models have not moved to the fields for the benefit of farmers, despite the fact that they are cost effective and environment friendly vis-à-vis the planned government schemes of irrigation and digging deep tube wells that involve investment worth crores. The Mahatma Gandhi National Rural Employment Guarantee Act (MNREGA) scheme that has now been implemented in the entire Himachal can help to carry the models of water conservation for irrigation to the fields. The models for conserving rain water for irrigation are the simplest form that is used for helping farmers of lower areas of Himachal. With rainy season already arriving in the region, it is high time that the model is carried to the fields and tested during this season. However, the way such a simple technology has been ignored, it seems that either the university authorities have failed to put it forward to the government or because of its simplicity it has not caught the attention of technocrats, bureaucrats and politicians of the state. Kangra district, especially the area along the Dhauladhar mountain ranges, is one of the wettest in the country. Still, according to agriculture experts, about 80 per cent area of the district faces acute shortage of drinking and irrigation water. In certain areas of the district, farmers have given up agriculture due to shortage of irrigation water. Their children are doing petty jobs in adjoining states far from their homes. Scientists at the FRS, Bajaura, in Kullu, has come out with a Rs 12-lakh mechanisation project procuring tillers, bush cutters, pole pruners and other equipment under the NHTM. “We will train farmers on how to use these equipments in orchards at the research station and give a demonstration of the same to them,” said Dr Shakti S Bhardwaj, Associate Director, FRS, Bajaura. 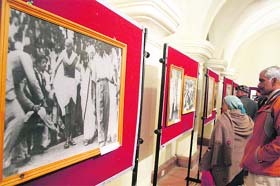 After attending Agri-Expo 2011 held in China in December, a delegation of farmers met the management of the NHB, apprised it of the highlights of the expo and urged it to hold a trade fair on the mechanisation of horticulture at Mashobra, near Shimla, showcasing all tools and machines being used by farmers in the world. The mechanisation of orchards will cut down dependence on labour by over 50 per cent, said Laxman Thakur, Chairman, Ecohorts, Society of Farmers, who had met the Managing Director, NHB, in New Delhi, after returning from China. More worrisome for farmers was that they were facing shortage of labour which, in turn, hit orchard management every year. Nepali labourers, the mainstay of the labour work of apple growers in the Shimla-Kullu and hilly areas of Mandi, had almost stop coming to these places as they were looking for more lucrative labour jobs in the Gulf and Arabian countries, said the farmers. Moreover, the government had opened the flood gates for the foreign direct investment in retail in the country. Farmers needed both pre-harvest and post-harvest mechanisation to make their fruit competent with the imported fruit in domestic markets, they said. Dr Bhardwaj said once the farmers were trained, the machine and tools could be provided under the NHTM on subsidised rates as the NHB has also planned a project on mechanisation of horticulture in the hill areas.“We await the approval of the project from the NHTM,” he added. Captain Kalia laid down his life in the Kargil conflict in 1999 while guarding the frontiers at Kargil. Dr Kalia has approached several national and international organisations to pressurise Pakistan to identify the culprits responsible for the brutal torture as evident from his body handed over by the Pakistani army to the Indian Army. Dr Kalia and Vijay Kalia, parents of the brave solider, are a harassed lot today. They have not forgotten what had happened 11 years ago. Their wounds are yet to heal. They are still struggling for their cause. Captain Kalia was the first officer to detect and inform about Pak intrusion while doing patrol duties in May 1999. Captain Kalia, along with five jawans, were captured on the Indian side of the LoC on May 15, 1999. Talking to this correspondent here today, the Kalia couple says that the Pak army had indulged in the worst form of torture of burning the soldiers with cigarettes, piercing their ears with hot iron rods, puncturing their eyes, breaking most of their bones and teeth and chopping off their limbs and private organs. Dr Kalia says his son had undergone this ordeal for 22 days. The Pak army ultimately shot him dead. The postmortem report confirms that the injuries were inflicted before death. He says capturing and being captured is part of every conflict between two countries. But their POW status was not intimated to India. They subjected them to such an inhuman and brutal treatment that violates the Geneva Convention to which both India and Pakistan are signatories. Reports said Deputy Commissioner Ritesh Chauhan had earlier asked the Deputy Director of Education (Primary) to ask all school heads to report to him if any of the old buildings of schools was in danger of collapsing or unsafe and liable to endanger lives of children. They were to get recommendation of officials of the HP PWD after spot inspection. A total of 22 school buildings are under threat of falling any day due to several defects and have been recommended to be demolished by the PWD. Now the Deputy Commissioner has ordered that these identified 22 buildings should be demolished immediately to avoid any untoward incident as had happened in Una district and some other places a few months ago. According to sources, three more primary school buildings are in the process of demolition and as soon as technical formalities are completed, these too will be demolished. Old buildings of Government Primary Schools at Gehadwin, Bhatoli, Amarpur, Mundkhar, Dangaar, Ghandalwin, Dadhole, Kallar, Bharadi, Morsinghi, Kosriyan-Kanettan, Talai, Rishikesh, Badhyat, Pantehada, Ram Bagh, Banolla, Kutheda, Dumehar, Balha-Churani, Bhalswaye and Bhagedi have been ordered to be demolished at the earliest. All privately run schools must obey scrupulously all provisions and conditions of the recently enforced Right to Education (RTE) Act, 2009, and observe all rules enforced by the HP Government under the Free Education to Children Rules, 2011, with immediate effect. This was stated by Deputy Director of Education (Primary), DDE (P) here recently. In a communication issued to all private schools, the DDE (P) said all schools that were running classes I to VIII must first get recognition for running such schools in the district from him. These schools must apply on the prescribed form by January 31 with the requisite fee for the same. He said any school which was functioning without any such recognition, would attract punishment of a fine up to Rs 1 lakh. He said for classes I to V such an application could be submitted to the Block Education Officer concerned, and from classes VI to VIII at the DDE (P) office. He said an inspection and recognition fee of Rs 5,000 and Rs 10,000 would be charged for schools running classes up to the fifth standard and seventh standard, respectively. All heads of such schools must submit an affidavit on the prescribed form 15 days before the start of every new session every year and must also pay a renewal fee of Rs 500 for recognition every year with this form. He said the university had failed to properly utilise the grant of Rs 9 crore provided by the UGC for the construction of hostels and it was not only forced to surrender the amount but also to pay a penalty of Rs 90 lakh. Similarly, another Rs 6 crore provided specifically for the construction of a girls’ hostel was also surrendered and the funds received for the multi-faculty building six years ago had not been spent so far. All this reflected the gross incompetency and inefficiency of the administration. In such a situation the association would not allow the authorities to increase the fees for which there was no justification and unnecessarily burden the students. It was the responsibility of the government to provide infrastructure for which it must increase the allocation in the budget. However, instead for pleading the case for enhancement in budget allocations, the authorities proposed to increase fee to raise resources. The annual budget deficit of the university came to Rs 12 crore whereas the fee hike would help raise only about Rs 1 crore and still there would be a revenue gap of Rs 11 crore. The plea of the authorities that a fee hike would enable it to provide better facilities was a farce as it had failed to provide basic infrastructure for courses for which already a high fee was being charged. The assertion that there had been no fee hike since 1973 was wrong as fees had been increased in 1997, 2006 and 2009. Instead of increasing the fee, the authorities should check wasteful expenditure. He warned that the university might have to face litigation due to a delay in resolving the financial crisis as superannuated teachers and employees, who had not been paid their retirement dues and benefits, could move court. The outstanding liabilities of the university on account of arrears of pay revision, pension, DA and other payments had crossed the Rs 25-crore mark. Only the government could bail out the university from this tight fiscal situation by raising the quantum of grant-in-aid from Rs 50 crore to Rs 62 crore. He urged Chief Minister PK Dhumal to intervene and help the university overcome the tight financial situation. Increasing the fee and other charges was one of the options as these were very low compared to institutions in the neighbouring states and even the state board of school education. The budgetary deficit had to be reduced and at the same time the university authorities must approach the state government for allocation of more funds in the general budget for 2012-13. He expressed satisfaction over the report of the sub-committee appointed to look into the anomaly in the scales of administrative officers which had favoured the existing UGC pattern which was on a par with teachers. While quashing the decision, Justice Sanjay Karol observed that “although ordinarily courts do not interfere in the price fixation, there is no absolute ban in this regard. If the price is fixed against the statutory provisions, a judicial review will be permissible. In the instant cases, the demand made by HIMUDA neither arises out of any contractual obligation nor statutory. It is arbitrary, unreasonable, unconscionable and unconstitutional”. According to the petitioners, the scheme was floated by the authority for the construction of a residential complex on a self-financing basis and according to the terms of the scheme they had made payments. In January 1994, the petitioners were informed that the cost of land was likely to be increased by 70 per cent. They also made the payment as demanded by the authority. Thereafter, in 1996 and 1997, lease deeds were also executed in favour of the petitioners (allottees) and all amounts due and payable by them were also recovered. The possession of the plots was handed over and they went ahead with the construction within the stipulated period of time. However, in June 2008, HIMUDA again raised a demand for money as “additional cost of land on account of enhanced compensation awarded by various courts”. The amount was calculated on the basis of the area of the plot at Rs 613 per sqm. The petitioners protested against this and formed the Residents Welfare Association to take up the issue with HIMUDA. While allowing the bunch of petitions, the court observed that there was no justification in recovering the enhanced cost only from the allottees as the development of common areas and amenities like parks, roads, sewerage, water and electricity and the enhanced compensation for the acquired land was with respect to the entire area of the project and not restricted to the “plotted area”. It also held the “opportunity cost” as totally illegal. It was neither contemplated in the scheme nor was there any statutory regulation in this regard. HIMUDA did not inform the allottees regarding it. The scientists found that the fungus named Piriformospora Indica (PFSI) increased both the growth and productivity of cauliflower, capsicum and tomato vegetable crops in hill areas of the state. Director General, Amity Institute of Training and Development (AITD) KS Bains said the National Centre of Organic Farming, an institution under the Union Ministry of Agriculture, had recommended the use of the fungus in all crops, especially in horticulture plants, grain crops and vegetables, as an ideal choice. He said a team of scientists conducted successful trials on vegetable crops in Kangra and Kullu districts in varied temperatures. About 125 farmers were provided free samples of the fungus for use on crops in about 150-kanal area. He added that field trials in both these places had been successful and the crop yield, quality and productivity had increased manifold due to the use of this fungus. It also improved the growth and overall biomass production of diverse hosts, including legumes, medicinal and economically important plants. Bains said Amity would also provide free samples of the fungus to apple orchardists in Himachal Pradesh for protecting from various diseases and improving the productivity and quality of the apple crop. The institute had appointed the Lahaual Potato Society, Manali, as its nodal agency for the promotion of the fungus in the farming community and it was in the process to appoint more such agencies in the state. These organisations said since various clearances for the cement plant to be set up by Harish Cement Ltd had already been cancelled by the Green Bench of the High Court of HP, the government, which had bagged an award for being environment friendly at the national level, should cancel the MoU which was signed by the then Congress government in 1995. Representatives of these organisations, headed by Joginder Singh, president, Himachal Kisan Sabha, Dharam Singh Prashar and Diwan Kaundal, president and secretary, Kishan Vikas Samiti, and Chuni Lal Sharma, president, Kishan Kalyan Samiti, submitted a memorandum to the Chief Minister. It was stated in the memorandum that residents of Sundernagar and adjoining villages did not want a cement plant here and even persons who had sold their land due to ignorance at throwaway prices now felt cheated. It was accepted by one and all that Modi had provided a new model of development and taken Gujarat to new heights. The Congress high command had been embarrassed and it had sought explanation from the state unit. He said former Prime Minister Jawaharlal Nehru had been highly appreciative of Atal Bihari Vajpayee for his intelligence, patriotism and political acumen and saw a lot of potential in him. The van used in the crime has been impounded and a case registered under Section 379 of the IPC. The police said Ajeet Kumar had consumed poison at his residence and was rushed to the DRPGMC Tanda last night where he died after struggling for life for a few hours. Ajeet was not in a position to depose before the police the reason for consuming the poison. However, his family members said he had consumed poison by mistake. His body after postmortem was handed over to his relatives. The police is investigating the case under Section 174 CrPC.